To ensure future delivery of emails, please add mailinglist @ indezine.com to your address book. Cartograms come in various types. 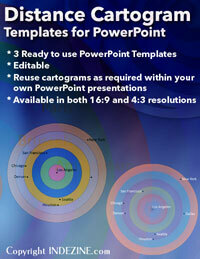 The easiest and most effective cartograms you can create within PowerPoint are distance cartograms. These distance cartograms are now becoming extremely popular, but creating them requires a fair amount of time and knowledge. But we've made this task easier for you. 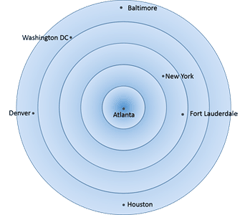 Try our "Distance Cartogram PowerPoint templates" kit. This kit contains ready-to-use templates that come with three types of distance cartogram samples, one each for Air Fares, Flight Times, and Driving Distances. You can easily change the topics, names and values as required. Remember that each larger circle you see in these cartogram graphics are not really circles - these are all individual donut shapes, sized perfectly for you so that you don’t have to work harder in creating and arranging them perfectly! A cartogram is a combination of a chart/diagram and a map and represents data in a way that makes it easier for the audience to grasp the point. It's entirely and easily possible to create and customize a Distance Cartogram using PowerPoint's native Shapes, Merge Shape commands, and various Fills and Effects. Drawing with the Scribble line tool is almost the same as drawing with the Freeform line tool -- but there is one vital difference. You don't need to double click to create an end point for your line with the Scribble tool. Also, once you start drawing with the Scribble tool, you can’t release the mouse button until you finish drawing. So, you can’t draw a perfect straight line as you would do with the Freeform line tool. The point where you release the mouse button will be the end point for the drawing. In many ways thus, the Scribble tool mimics real life usage as you draw with a pencil on a piece of paper. Your line stops drawing the minute you stop drawing it without having to double-click. Once you insert a new table on your PowerPoint slide, probably the very next task you would want to do is to fill the cells with required content. There are more than one of ways in which you can populate your table with content in PowerPoint 2013. In this tutorial we'll explore these ways -- let us start with exploring the ways to navigate from cell to cell within a table. If you want to use a table in your presentation, you can insert a new table on your PowerPoint slide and then enter content within this table as required. However, as it happens frequently, there may be a table already created within Excel or Word, or the table content may already be populated in a bunch of contiguous Excel cells. Whether you have, a ready-made table, or just a group of in contiguous cells in Excel, it is very easy to import it into PowerPoint 2013 as a table. Since the Copy and Paste options work similarly for both Excel and Word tables, it really does not matter what your source is, although in this example we are taking a table created within Excel. Gears -- these denote that things are moving, something is happening. Yes, gears mean action. Have you ever wanted to use animated or non animated gear graphics in your PowerPoint slides? We have just what you need -- these ready-to-use awesome gears will save you tons of time. 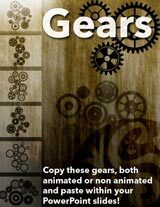 In fact, if you need to spend an hour or two to animate them, then you will be happy to know that we have included animated variants of all gears. Use the ones you want -- either animated or non-animated or even both. To use them, all you need to do is copy them and paste in your own slides! Download and use gear graphics in your slides. Size of text becomes bigger without changing the size? Has anyone found a way to lock page numbers down? You can also find new templates everyday on the PowerPoint blog along with information on what's new and happening in the world of PowerPoint -- check out at http://blog.indezine.com/.